Storyline: The Suicide Squad is formed and dispatched to break into Arkham Asylum. Their goal is to retrieve information that the Riddler stole before his incarceration. Meanwhile, Batman looks for a bomb that the Joker has hidden before it can destroy Gotham City. This film is enjoyable and visually exciting, and DC fans old and new will love the way these familiar characters are portrayed. The soundtrack is invasive and distracting, and plot goes out the window about halfway through in favour of fighting and explosions. This film portrays its characters very well, particularly the Suicide Squad, but it doesn’t do a whole lot with them. If you are looking for entertainment that doesn’t delve too deep into plot, overall arcs, and characterisation, then this is great. If you are a serious comic book fan and want to spend more time with characters, then stick to reading about them. The first and most important thing to be said about his film is that it is a lot of fun. It’s just over an hour of humour, explosions, fight scenes, and cool Batman-related visuals; essentially, it’s everything you could want in a Batman animated movie. The second thing to be said is that it absolutely nails the characters. Harley Quinn, in particular, is an absolute delight. Hynden Walch is a perfect Harley, with just the right mixture of idiocy, insanity, and pathos needed to make her simultaneously sympathetic and hilarious. Credit also has to go to Neal McDonough as Deadshot; he does an excellent job of making Deadshot almost irritatingly self-righteous but still likeable, and you do root for him throughout the movie. The movie’s plot is fairly basic, which is good, as it is pretty much abandoned about a third of the way through in order to focus on explosions, fighting, and one-liners. This is great if it’s what you like, but I got bored when the movie started moving from fight to fight without much else seeming to take place. Amanda “The Wall” Waller (voiced to perfection by Sons of Anarchy’s CCH Pounder) forcibly pulls the Suicide Squad together from convicted criminals, and places bombs in their necks so they cannot run out on the mission. They are tasked with breaking into Arkham Asylum to recover the Riddler’s cane, which has been used to store top-secret information. Meanwhile, the Joker has planted a bomb somewhere in Gotham, and Batman is looking for it. Naturally, the Squad’s own agendas become a focus of the mission too, despite the wishes of the somewhat shady government-linked puppet master Amanda Waller. Of course, the Suicide Squad is really all about villains and outcasts, and Batman: Assault on Arkham makes that clear from the beginning. The members of the Suicide Squad clearly don’t like each other or themselves enough to make a successful team. Yet the dynamics work so well that the already-quite-high level of suspension of disbelief needed for comic book movies doesn’t need to climb much higher. The only exception to this rule is the combination of Killer Frost and King Shark: their borderline creepy friendship/pseudo-romance is an interesting addition to the group dynamic. Comic book fans have high standards for adaptations, and this one falls down on a few points. For one thing, Captain Boomerang is the proud owner of the worst Australian accent in animation history. It constantly, and distractingly, veers from Crocodile Dundee territory to actor Greg Ellis’ own English accent, albeit with a weird Cockney twist. Would a native Australian really have been that hard to find? For another, the characters are well-portrayed, but there is a bit too much of an effort made to showcase every single popular Batman villain in one fairly short movie. This means that while we are treated to a funny or interesting moment with each of them, it’s far too brief. Personally, I’d have enjoyed more time with each character. The only exception to this rule is Harley, who was the real star, and the Riddler, who was simply perfect in his relatively short screen time (he is voiced by the ever-charming Matthew Gray Gubler). Finally, the soundtrack was over the top and distracting a lot of the time; it seemed to be trying to emulate Blade, but just ended up feeling out of place for much of the movie. Overall, this is a great movie for a bit of entertainment and some laughs, but serious comic fans out there will be left looking for more. It will be particularly appealing to a younger audience, or viewers that aren’t especially interested in comics but who love Batman and great animated action. 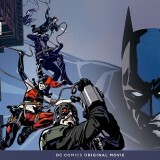 Batman: Assault on Arkham is well worth a watch. Find the most competitive price for Batman: Assault on Arkham in the table below. If viewing from a mobile device please click on + to get more information.